White collar workers — including lawyers, consultants, financial advisors, journalists, traders, and more — will all face the effects of AI. When artificial intelligence (AI) and its impact on jobs and the economy comes up, the conversation centers on blue collar jobs. Per The State of Automation Report, there are 4.6M such jobs at risk in the USA due to AI. But, the jobs of MBAs and their white-collar brethren will also be impacted dramatically by AI. A growing wave of AI-infused Expert Automation & Augmentation Software (EAAS, pronounced /ēz/) platforms will usher in a new era of AI-assisted or AI-enhanced productivity. 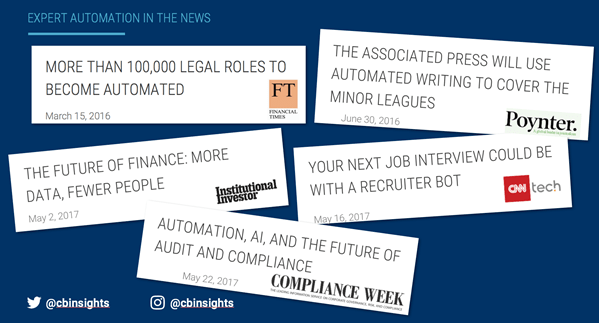 This AI-enhanced productivity is threatening jobs at the lower end of the white-collar spectrum as evidenced by these recent headlines. But to start, Expert Automation & Augmentation Software will be more focused on augmentation, i.e., helping humans do countless complex tasks that are either beyond human cognition and/or inefficient for human beings to do (read thousands of pages of patents and understand key topics). Think of these AI-enhanced assistants as junior analysts (lawyers, journalists, etc) who never tire and who can process information beyond human capacity but who will still need the steady eye of a manager to make subjective judgments. But as with many things in technology, change comes gradually and then suddenly. So while the applications of EAAs platforms may be at the lower-end today, they will get more sophisticated with time. Below is a detailed breakdown of the many industries and jobs that Expert Automation & Augmentation Software platforms are changing ranging from finance to journalists to HR managers. With white collar jobs across an array of industries at risk, we wanted to understand how machine intelligence is being used to augment and automate what these professionals do to understand the broader EAAS landscape. But first, what is Expert Automation & Augmentation (EAAS) Software? EAAS is software that uses machine intelligence to replicate and augment human cognition. 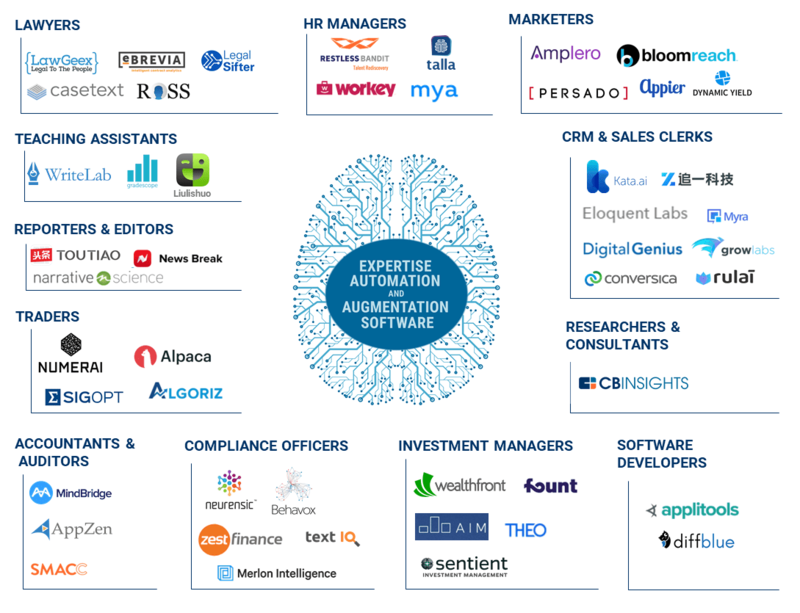 The EAAS market map below highlights some of the 40+ insurgent startup technology leaders building expert automation & augmentation software across any number of industries ranging from lawyers to journalists to wealth managers to traders to consulting, and more. We detail and profile some of the EAAS players, approaches, results, and philosophies by industry. Click any of the below to be taken directly to those areas. 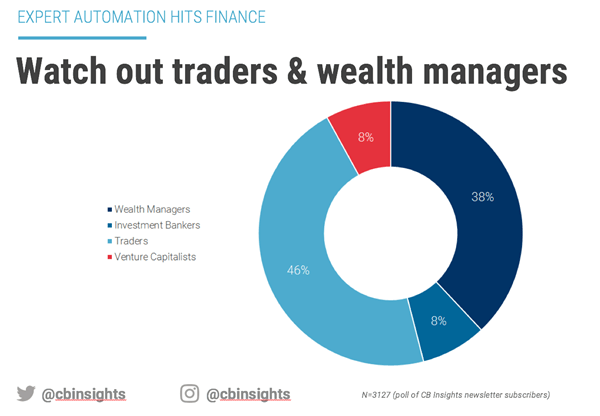 Within finance, a recent survey by CB Insights revealed that traders and wealth managers are at the greatest risk of being automated due to AI. Venture capitalists, who bet on the disruption of others, and investment bankers fared better. Per the poll results above, investment management / wealth management is an area that EAAS platforms are projected to hit hardest and quickest. And that has started with the category broadly known as robo-advisors. EAAS companies targeting investment and wealth management include Wealthfront, Fount, AIM, and Sentient, among others. Wealthfront is unflinching in its desire to automate the experts with CEO Andy Rachleff penning a post that makes clear the company’s position on this subject with his post “Software is Better Than People.” (Note: analysis of Wealthfront’s AUM trends here). He goes on to write that AI-enabled software not only provides better services but also opens up the investment management market to individuals who’d previously not had access to such services (previously just for the wealthy). In addition to Wealthfront, other startups in the space include Fount, AIM, and Sentient. The other area that the aforementioned poll saw AI impacting in finance was trading. And in trading, there are another set of EAAS companies trying to replicate and improve human cognition with quantitative trading technologies. At the Future of Fintech Conference, Jonathan Larkin of Quantopian, Christina Qi of Domeyard, and Andy Weissman of Union Square Ventures discussed algorithmic training and the hedge fund of the future, and openly discussed the lack of need for MBAs. These algorithmic traders and hedge funds are using AI-enabled quantitative trading strategies that were not possible before and which hold the promise of delivering above-market returns and AI-enabled management of risk. Some of the EAAS companies leveraging AI to change trading include Numerai, Alpaca, and SigOpt. Interestingly, the impact of AI in trading and investment management can be seen most starkly in the hedge fund world. Institutional Investor’s Alpha magazine ranked the 25 best-paid hedge fund managers and 8 of the top 10 were algorithmic funds (not active managers). David Siegel, cofounder of quant hedge fund Two Sigma Investments, recently said “no human investment manager will be able to beat the computer.” From this article in the Guardian, we see the funds making money are those eschewing fundamental analysis in favor of algorithmic investing and trading strategies. A Bloomberg article on the automation of Wall Street highlights the common refrain that AI will relieve staff of routine tasks. Although unspoken, the relieving of people from routine tasks will also lead to companies relieving people of their jobs. Goldman Sachs is hiring more in technology than in traditional finance roles as this mining of job postings by CB Insights reveals. Outside of finance, Human Resources (HR) tech is another area with an abundance of data to train AI algorithms. Recently, Google released a beta version of its machine learning-based Cloud Job Discovery platform. It uses neural networks and language processing to map job descriptions to candidates with the right skill sets — something traditionally done by recruiters. Startups are using AI to automate various steps of the recruitment and on-boarding process, from resume parsing, sentiment analysis in interviews, and using chatbots for monitoring compliance. One such company is California-based startup Mya. The AI bot uses language processing to engage applicants in a pre-screening conversation. Each candidate is given a score based on the responses, and Mya automatically schedules interviews between qualified applicants and a human recruiter. “Recruiters spend 60% of their time reading CVs… Why should a person read 300 resumes if a machine can propose the top 10?” – Juergen Mueller, SAP’s chief innovation officer, Wall Street Journal. Another company here is Restless Bandit. The startup was co-founded by Steve Goodman, who previously founded job search platform Bright.com (acquired by Linkedin in 2014). The startup’s AI algorithms were reportedly trained using over 30M job applications and 100M job descriptions. It has a resume pool of 100M applicants, from its own database as well as its network of job sites (excluding Linkedin). Apart from finding qualified candidates from within its own database, Restless Bandit scans employers’ existing database of previous applicants to “rediscover” talent for current positions in the company. A popular bot for recruitment, Talla, recently raised an $8.3M Series A. Talla automates on-boarding, employee training, scheduling important tasks, and answering basic, repetitive questions that employees would otherwise direct to the HR staff. Talla, which runs on Slack, boasts a clientele of 2,000+ companies. Another area which is seeing a growing number of EAAS platforms has been in work to automate the work of reporters, journalists, and editors. One of the high-flyers of the EAAS space is China-based Toutiao officially known as Jinri Toutiao (aka Bytedance). It raised $1B from Sequoia Capital China and CCB International in April 2017 at a whisper valuation of $11B, and a $2B follow-on round in August 2017 which sent its valuation soaring to $20B, making it one of the world’s most highly valued unicorns. Toutiao uses AI to analyze content features and user interactions with content to programmatically curate and create a tailored news feed for each reader. They’ve also developed what are called “robot reporters” as detailed by the WSJ to generate 400 news briefs about the Rio Olympics. Other EAAS platforms tackling the world of journalism include Automated Insights whose robo-reports are used by the AP to do earnings briefs allowing the AP to greatly increase its coverage of earnings calls via automation. Using human journalists and editors to do this before limited the scale of coverage the AP was able to provide. Another EAAS technology company in the space is Narrative Science. The company has several patents for generating a narrative story using data and angles, and can be found on the CB Insights platform using our patent search engine. Narrative Science garnered a great deal of attention initially for its technology with the promise that its EAAS platform could write news better than journalists. The company has since evolved past journalism focusing on what are likely more lucrative verticals such as financial services, government, and CPG-retail, but it’s roots at automating the journalist are notable as one of the earliest EAAS platforms. Artificial intelligence has a huge potential to reduce time and improve efficiency in legal work. On the litigation side, natural language processing (text analytics) can summarize thousands of pages of legal documents within minutes — a task that might take a human counterpart several days to complete — while reducing the probability of error. As AI platforms become more efficient and commercially ready, this will impact the fee structure of law firms that charge by the hour on the revenue side but also be a potential cost savings as they will be able to hire fewer junior lawyers. Big multinational law firms are already preparing for the changes AI would bring to the industry, and capitalizing on it. For instance, Europe-based Pinsent Masons claims it has developed its own AI technology called Term Frame, which reportedly helped the firm in 7,000 matters ranging from dispute resolution to contract reviews. Others are keeping a tab on the latest in tech through accelerator programs. For instance, NextLaw Labs, a wholly owned subsidiary of multinational law firm Dentons, invested in IBM Watson-powered AI legal tech startup ROSS Intelligence. Legal tech AI startups have been a particularly hot area within the EAAS landscape. Notable companies include Palo Alto-based Casetext, which is developing an AI-based legal research assistant, CARA. The company’s most recent $12M Series B round was backed by 8VC, Canvas Ventures, Red Sea Ventures, and Union Square Ventures. Another startup, Israel-based LawGeex raised $7M in Series A financing in March 2017 to use AI for automatically reviewing business contracts. The green lines in the graph below show investments to some of the early-stage startups here. According to a new research by Forrester, majority of the marketing executives surveyed believed AI had to be integrated into their marketing technologies to make sense of the data. This is a recurring problem that EAAS solutions can address. We have tons of information that is valuable, but beyond human cognition. AI is automating different branding and marketing efforts, and creating personalized campaigns, targeted messaging, personalized website experience, and social media sentiment analysis. New York-based Persado is developing a multi-channel personalized messaging solution. It uses a “wheel of emotions” to identify words and images that would best elicit an emotional response from customers. Persado’s clients include travel and retail giants like Norwegian CruiseLine, Hotels.com, Burlington, and Sears. It raised $30M in a Series C in Q2’16 from investors including American Express Ventures, Citi Ventures, and Goldman Sachs. Another startup here is BloomReach, which is moving away from a one-size-fits-all approach. BloomReach is backed by investors like Battery Ventures, Lightspeed, NEA, and Salesforce. Softbank Group recently backed Appier, which is using AI to understand consumer behavior across devices. The above companies have applied for patents for message optimization, cross platform user joining, and a computer program for identifying message content to send to users based on user language characteristics, among other things. Although AI software development is one the most coveted jobs today, AI software is removing the safety net for entry-level software developers. Yes — the AI software developers are developing AI that automates the work of AI software developers. Early-stage deals are emerging to startups focused on AI-based software testing, debugging, and basic frontend development. One of the top rounds last year went to UK-based DiffBlue, which is developing AI to automate traditional coding tasks like bug fixing, custom code development, and translating code from one programming language to another. An Oxford University spinoff, it raised $22M in Series A funding from Goldman Sachs, Oxford Investment Consultants, and Oxford Sciences Innovation. One of the earliest deals to startups using AI for software testing went to Applitool, which went on to raise $8M in Series B financing in Q3’17, backed by smart money VC Bessemer Venture Partners, among others. The image below shows recent deals to AI for software development and debugging on the CB Insights platform (track all AI deals by industry here). Healthcare and education are considered to be some of the industries least at risk of automation due to the dynamic nature of tasks requiring a high level of emotional intelligence. But AI startups are beginning to provide ancillary services like paper grading and feedback on writing. With the widespread teacher shortage across the United States, AI in education can have several possible applications to alleviate the situation, including the use of natural language processing to consolidate research information, virtual tutors, AI-assisted paper grading, and personalized education programs. In Q1’16, investors including Bloomberg Beta and Reach Capital (early-stage ed tech investor) seed-funded AI-assisted paper grading startup Gradescope. In Q1’17, Reach Capital also participated in a Series A-II round to WriteLab, which uses natural lanugage processing and machine learning to provide feedback on writing. A recent $100M mega-round went to Liulishuo in China, which is developing an AI English tutor. The app reportedly has over 45M registered users. The audit process follows a systematic methodology that is inherently repetitive, and data acquisition is at the heart of auditing. Auditors obtain lots of raw data sets like financial transactions and check for accuracy, anomalies, and alignment, prime applications for AI to stream-line through automation. According to a study published by the World Economic Forum, 75% of the 300 corporate executives surveyed predict AI will perform 30% of corporate audits by 2025. Early-stage deals to AI in accounting and auditing are beginning to emrege. Kingston Smith, the Bank of England, and BDO USA are all reportedly testing the AI auditing tool developed by Canadian startup Mindbridge.ai. It raised $3.25M in June 2017 and entered into the Bank of England accelerator in October 2017..
Another startup here is Bloomberg Beta-backed AppZen, which is focued on automating expense report auditing. Its customers include National Instruments, Hitachi, and Comcast. 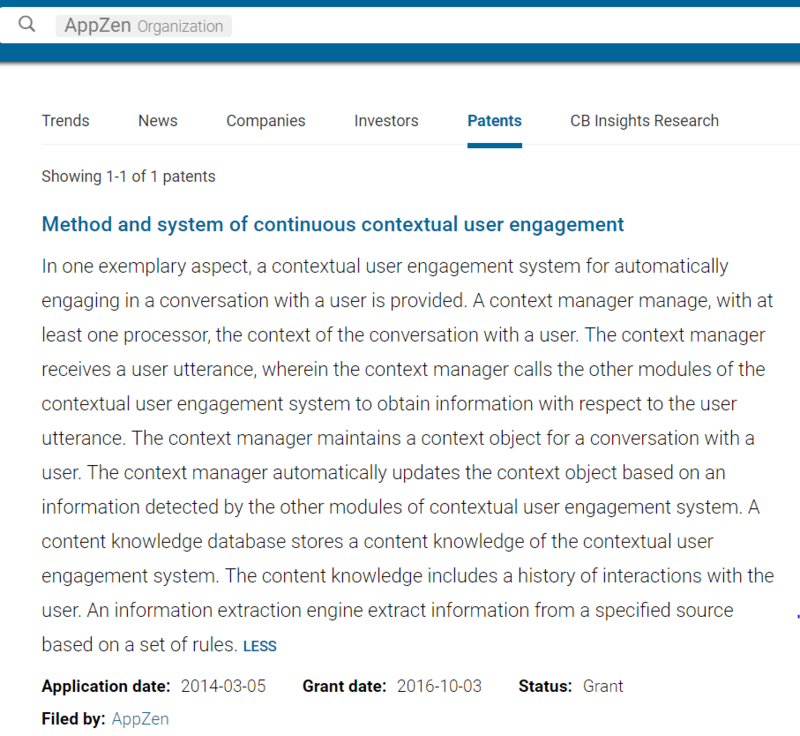 AppZen integrates with existing tools from Oracle and Concur. The cost of regulatory compliance, currently estimated to be around $80 billion globally. Similar to audit, compliance follows a methodical, repetitive process, and regulators themselves are some of the earliest adopters of AI to aid in enforcing compliance with the regulatory requirements they mandate. The UK’s Financial Conduct Authority (FCA) has been a leader in adopting regulatory technology or regtech, by opening up a regulatory sandbox for firms to incubate and develop the tech with declassified data in an unregulated environment. Earlier last year, Tim cook noted one of FCA’s goals from the regulatory sandbox is to transpose the rules into unambiguous text that can be universally interpreted by machines. IBM is actively developing a compliance use case for Watson and acquired regulatory consultancey Promontory Finconsultancy to train Watson on how to interupt regulatory rules. However, Watson’s progress has been underwhelming relative to the hype, suggesting compliance professionals may be safe in short term from being fully terminated by AI. One of the startups here, Neurensic, focuses on compliance and trading surveillance. It was scooped up in Q4’17 by Illinois-based trading software developer Trading Technologies. Consulting spend topped $58 billion in 2016 in the USA. And that advice, described as “bespoke” (a fancy word for expensive and human-based) requires lots of work that machines are actually better suited to. Of course, like many other areas where EAAS is taking hold, software will not replace subjective guidance and advice. But machines will do the data gathering, cleaning, and processing as well as the analysis, basic interpretation, and even the presentation work. EAAS platforms handling basic interpretation is something that consultants will likely bristle at, but several trends and forces make it possible and necessary. See pages 7-32 of this report for more on these trends. This is tens of thousands of pages of unstructured text coupled with spreadsheets of structured or semi-structured data that 5 consultants simply cannot process. And so this team of 5 is left to look at the most recent information or read the imperfect summaries / assessments of equity research analysts or other advisors making their judgments on top of other highly imperfect judgments thus compounding the issue. Pick your cognitive bias, but many are at play in such a situation. And simply put, machines are made for this challenge. One EAAS platform working on changing research & consulting is CB Insights. Disclaimer: yes, that’s us. This is the first time we’ve put ourselves on our own market map. So as not to talk about ourselves, we’ll simply leave you with this passage from an article titled “The Business Consulting Industry is Booming, and It’s About to Be Disrupted,” which discusses CB Insights. Salesforce announced on its website that Einstein’s “spring release will be a major breakthrough for sales leaders and reps alike.” It is using NLP to surface high priority emails, and insroducing advanced predictive forecasting for sales. Smart money VCs as well as corporate investors are backing new companies at the crosssection of AI and CRM. To name a few, Khosla Ventures participated in a $1.5M seed round to customer support platform Eloquent Labs, and Floodgate seed-funded Myra Labs. Zhuiyi Technology in China rasied nearly $21M in Q4’17 to develop a deep learning customer service chatbot. Our recently released Artificial Intelligence 100 (AI 100) also highlights several EAAS players working on solutions for sales including Conversica. There is a great deal of innovation happening within the EAAS landscape, so we’ll continue to monitor it. It would be alarmist to say that the jobs of sales professionals, lawyers, traders, consultants, and wealth managers are going away any time soon. But as these EAAS platforms continue to gain new skills and become more proficient at jobs and tasks that might have been considered impossible for machines to handle even just 5 years ago, white-collar professionals will see their job responsibilities change dramatically. For those individuals and organizations that can successfully use EAAS to augment what their teams are doing, there are immense competitive advantages in the form of better products and services, as well as in lower costs. Previous « Converting Abandoned Malls Into Cooperative Ecosystems.